Yesterday a fire broke out at the Olatu complex in The Basque country, engulfing the building in flames which took over five hours to extinguish. Luckily all the workers at the factory, which makes Pukas, Lost and _ boards, were evacuated safely, however one is being treated in hospital for smoke inhalation. Five of the team of fire fighters working to contain the inferno were also taken to hospital to be treated for the same affliction. The cause of the fire is still unclear, however many of the materials used to build boards are highly flammable, and it’s possible the soaring temperatures, which have caused forest fires in Portugal, were a contributing factor. 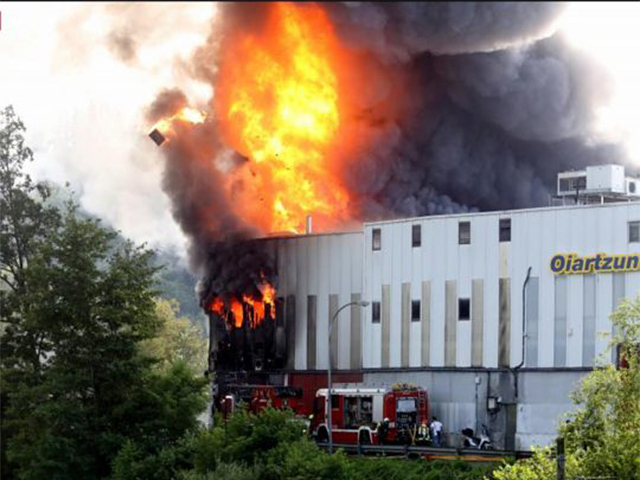 We’d like to extend our sympathies to them and wish them all the best in restoring the factory to its former glory.